The history of my ginkgo is interesting from two standpoints. One because it was planted when Logan was born and she is the reason I became interested in organics. The second reason is how remarkably well the tree has grown over the past twenty-five years. The growth has been far more aggressive than any ginkgo I’ve ever seen. The largest ginkgo in the Dallas Fort Worth area is in Samuel Park and my tree is getting very close to having the same overall canopy size. The other tree is probably 70+ years old. When planted in 1985 my tree was an 8 foot tree with about 1 1/2 inch caliper. I did not know at that point about the danger of planting trees too low, but I did use the organic planting techniques that I had already developed and luckily planted the tree almost high enough. The later removal of the soil and exposure of the flare is another reason the tree has done so well. From the very beginning the tree was fertilized with organic fertilizers and mulched with compost and natural shredded tree trimmings. It has never had any synthetic products used anywhere near it. The tree is in an area of the garden where moisture is not excessive but good, being on the downhill slope of the backyard. I’ve learned the hard way on other projects that ginkgo has a need for deep soil. It does not like white rock or probably any other rock near the surface and it also not as drought tolerant as some of our native plants, but once established it is a very low maintenance plant if given reasonable moisture. The fact that the ginkgo is an ancient tree, dating back to the dinosaur ages, probably makes it more responsive to the organic approach. I have not designed very many ginkgos into commercial projects for two reasons. One is that many of the ginkgos coming from the nursery industry are very tall and spindly and don’t get off to a good start planted out in the middle of parking lots. Also there aren’t enough organic projects yet. I would never use ginkgo in anything but an organic project. The other reason I don’t use that many is that I plant native trees whenever possible. One of the issues you’ll see talked about in most tree publications is a warning to always purchase grafted or cloned ginkgos to make sure male plants are planted. However, the tree tag stating “male tree” does not always guarantee a male tree. Mine was supposed to have been male but by about year 14 it started producing fruit. I’m glad mine is a female because I collect the fruit to use in ways that are explained on the website listed below and to propagate new ginkgo trees. The fall color as you can see in the photographs is spectacular. 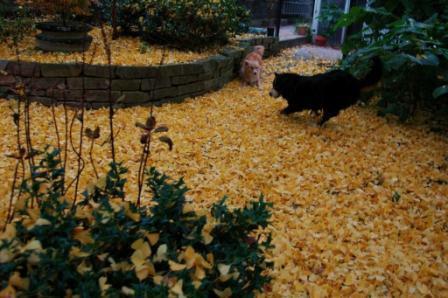 Some years are better than others, but my favorite time of ginkgo fall color is when a substantial amount of foliage has fallen from the tree and is on the ground. The color seems to last longer on the ground than from any tree I’ve ever seen. 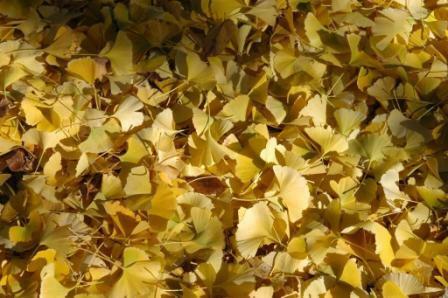 So, plant ginkgo but use a limited number of these trees on the property and enjoy the color and the history and the medicinal benefits from the foliage and the fruit. HEIGHT: 50 to 70 feet. Trees have been identified as growing to as much as 100 feet. 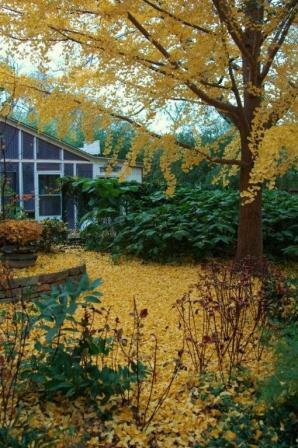 NATURAL HABITAT AND PREFERRED SITE: Ginkgo is native to China but adapts to a wide range of soils as long as there is ample moisture and decent drainage. The only place in Texas I have seen the plant not grow well is in solid white rock or in soils that are too dry. Ginkgo tolerates a wide range of rough conditions such as downtown urban sites, smoky areas, air pollution and confined root system spaces. 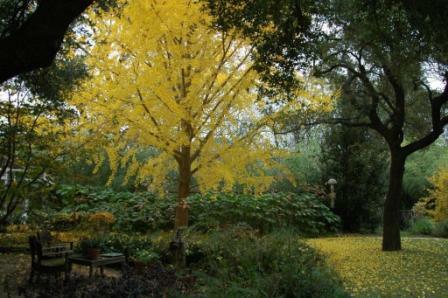 I have discovered working with my ginkgo at home that the tree responds dramatically to the organic program and grows as much as 24 inches a year in ideal conditions - in soil has lots of organic matter, lots of life, moisture and is fairly well drained. It is a classic example of trees responding to the organic program and the beneficial fungi that grows on the roots of healthy plants. FOLIAGE: Leaves are medium green in the summer, fan-shaped and beautiful. 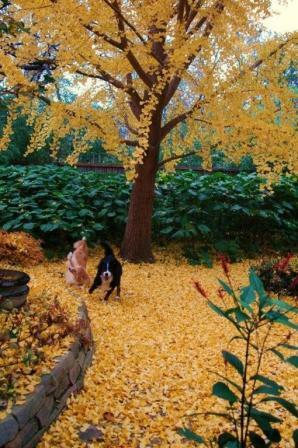 Spectacular yellow fall color that doesn’t last very long - tends to fall all at one time. Green leaves are where the medicinal properties lie for aid in increasing the circulation to the brain. Ginkgo biloba capsules are the best source of the proper concentration of the medicinal herb. 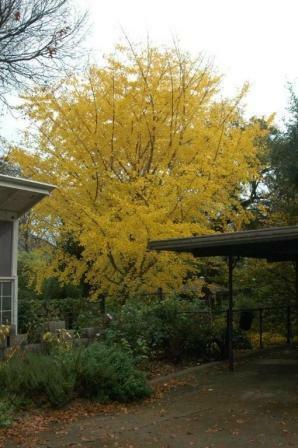 CULTURE: Ginkgo grows well in most well-drained soils but does not like solid white rock, especially the limestone rock of north Texas. It has moderate water needs and fertilizer requirements. It responds beautifully to the organic program. PROBLEMS: Ginkgo has few problems. I have never seen any insect or disease damage. Everything bad relates to dry or rocky soil or fertilizing with high-nitrogen, synthetic fertilizers. Another problem is the female trees have a fruit that is stinky. It is difficult to know for sure whether you have a female because the fruit normally does not start to form until the tree is about fourteen years old. 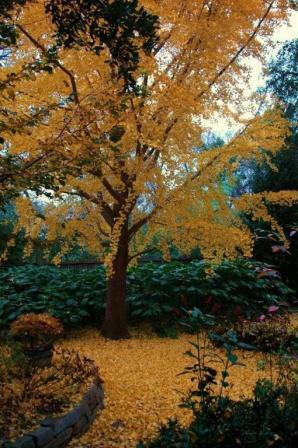 INSIGHT: Ginkgo has been called a “living fossil and also the “tree of life”. 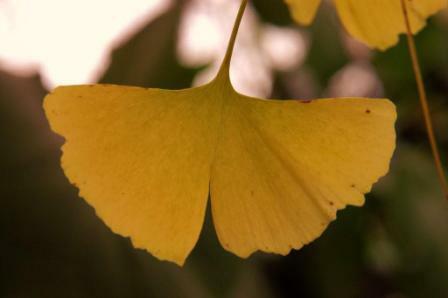 Buddhist monks believed the ginkgo could restore youth and vitality. I think they were right. It is one of the oldest trees on earth and can be found on every continent in the world. 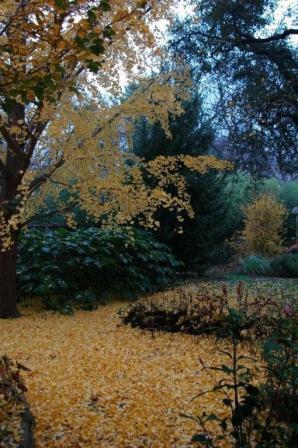 Ginkgo can ultimately reach a height of over 120 feet. It was first identified from fossil records in China and has a reputation of being an extremely slow grower. The secret is simply Nature’s secret – the organic program. The tree’s root system when it has the natural beneficial fungi is the key. Ginkgos are believed to be approximately 200 million years old. 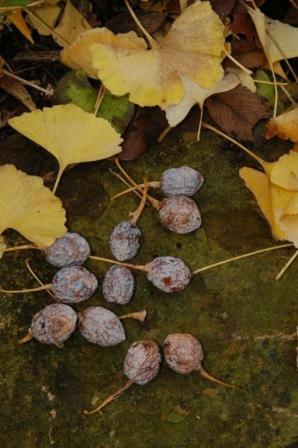 There is indication in some Chinese publications that ginkgos may be as old as 2000 years. “The King of Trees” is the imperial title given by the emperor of Quianlong in the 18th Century in Beijing. The name ginkgo is from the Chinese word meaning silver fruit. The species name biloba refers to the two-lobed leaves.